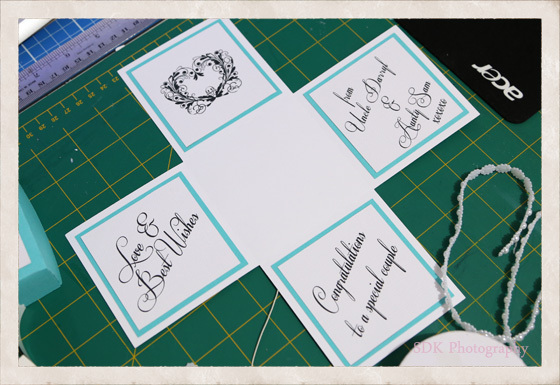 More wedding crafting, this time I wanted to make a wedding card... but it had to be something different of course. Google searching netted images of Explosion Boxes... ooo these looked fun and something I hadn't tried before, I was thinking three tier cake in the middle. Mind you this was two days before I was due to fly up to the wedding...hahahaha. 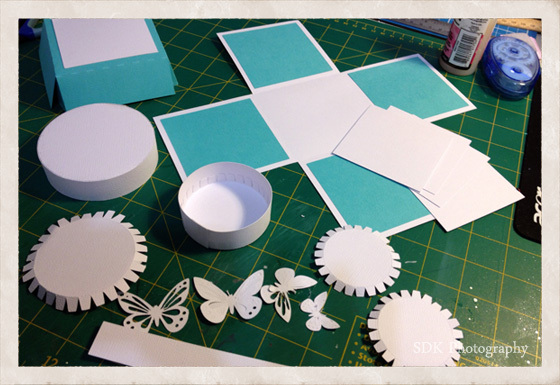 I read a few blogs on how to create these little wonders and even purchased a cut file from the Silhouette store to get me started. I tweaked the cut file a little to make the box the style and size I wanted. Then cut a practice box to see how it would all go together. First attempt was not bad, just a bit more tweaking of the cut file and I was ready for the real thing. 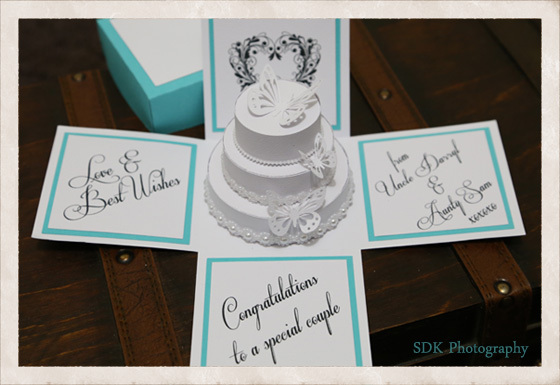 With a lttle help from Photoshop and the Silhouette program I created a cut file for the cake layers. I had the tabs for gluing on the circular pieces of the cake, I just found it was easier to put together this way. 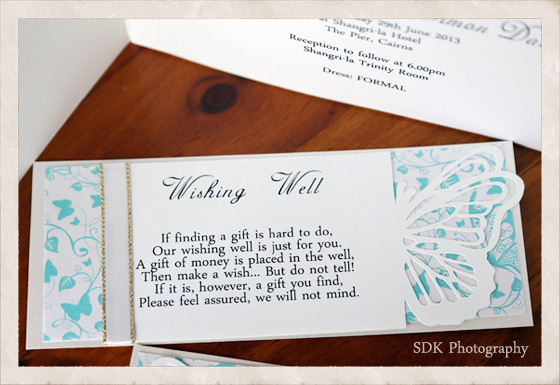 I used Photoshop again and my trusty Epson printer for the wedding wishes inside the box. 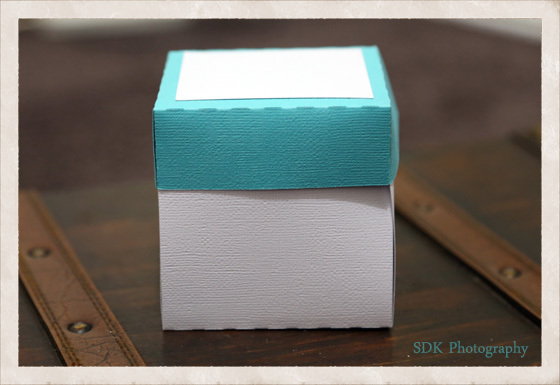 One awesomely cute explosion box to wish the newly married couple well. If you have ever wanted to make one... do it! DOWNLOAD HERE! If you would like a copy of the template I created! Now this sign was fun and a little challenging as I had to learn how to make text look like chalk in Photoshop. Truly I don't know what I would do without Google...hehehe. Yep Google searched how to create a chalk text in Photoshop and found some blackboard backgrounds. 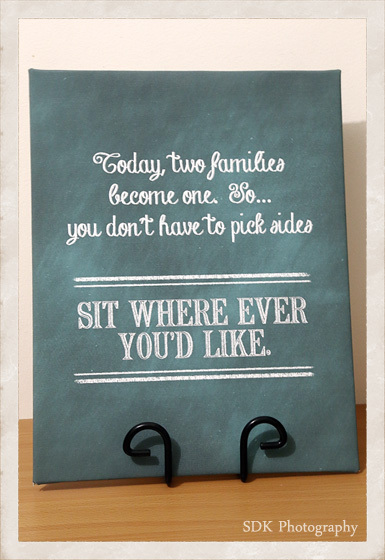 I printed the sign onto canvas which I think really helped give a realistic blackboard/chalk effect. The Thank You sign was another pinterest find... what a lovely way for the Bride and Groom to say thank you on the day to all the people that are important to them. 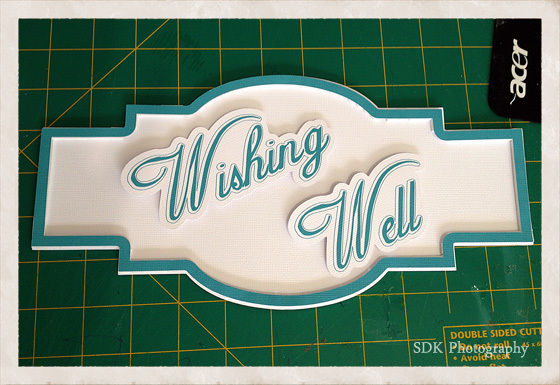 Photoshop to the rescue for the text and my Cameo to print and cut. First time I had really played with patterned paper for rosettes too. Oh and I embossed the butterfly to give it a bit more depth and texture. Again a super easy project that turned out great. But lets be honest aren't they all! Hubby and I had the pleasure of attending a nephew's wedding a couple of weekends back. A gorgeous day in far north Queensland, a beautiful Bride and fantastic reception... we really are so very blessed to have been a part of it all! I did have just a little bit of a hand in the invites and some signs... so much fun to make but I couldn't do any of this without photoshop and my cameo. Thought I would share a few pics of what we did. 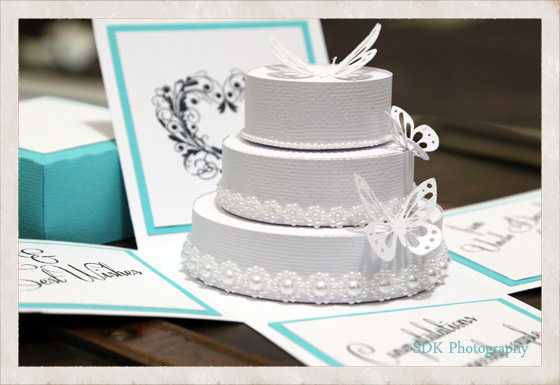 My gorgeous (new) Niece had a butterfly theme so the invites were designed with this in mind. 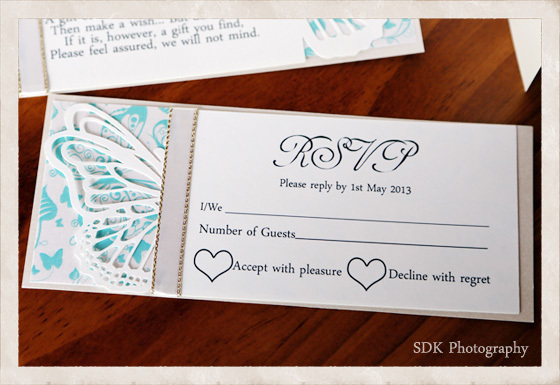 For the RSVP and Wishing Well, I used the print and cut setting on the cameo...love, love, love this feature! 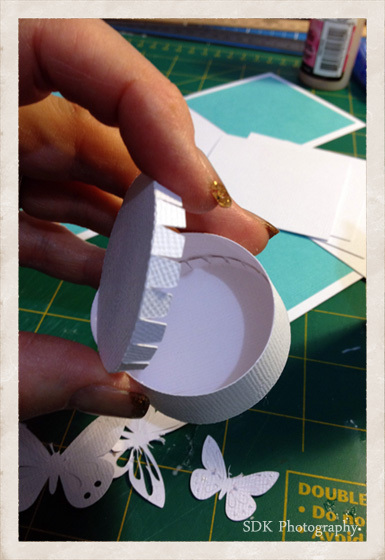 Helpful tip of the day - have a spare cutting mat and blade at the ready if you ever decide to do multiple cuts of one design that is a little intricate. I was tearing my hair out at one stage because the cutting blade would skip sections of the design. Turns out lots of paper fibres had got inside the blade housing and was making it stop... a new blade fixed that issue. A new super tacky mat will help to keep most of the paper fibre on the mat too. 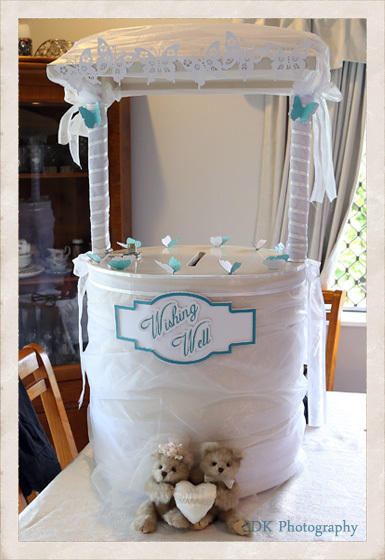 and the Wishing Well... isn't this pretty and so easy to do when you have a ton of organza, a hot glue gun and some super cute butterflies cut with the silhouette cameo. It was after I took this photo I noticed the ribbons weren't even on the sides...lol. Good job I spotted the oops be for the Bride-to-Be saw it!